Modern Problems in Condensed Matter Sciences, Volume 27.1: Landau Level Spectroscopy focuses on the processes, reactions, methodologies, and approaches involved in condensed matter sciences, including semiconductors, resonances, and spectroscopy. The selection first tackles cyclotron resonance and phonon-assisted cyclotron resonance. Discussions focus on absorption coefficient for phonon-assisted transitions, effect of a direct current electric field, cyclotron resonance as a kinetics experiment, and cyclotron resonance in the quantum limit. The manuscript then takes a look at polaron effects in cyclotron resonance and electric-dipole spin resonances. The book examines spin-flip Raman scattering and magnetoplasma effects in IV-VI compounds. Topics include magnetoplasma effects in strained semiconductor layers; magnetoplasma effects in two-dimensional systems; experimental and theoretical results of nonmagnetic semiconductors; and experimental and theoretical results of diluted magnetic semiconductors. The manuscript then surveys the interband magneto-optics of semiconductors as diamagnetic exciton spectroscopy and interband magneto-optics in narrow-gap semiconductors. 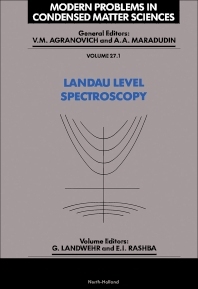 The selection is a dependable source of information for scientists and readers interested in the Landau level spectroscopy.